Valiant is excited to announce that it has promoted Julia Walchuk to the position of Sales and Live Events Manager. 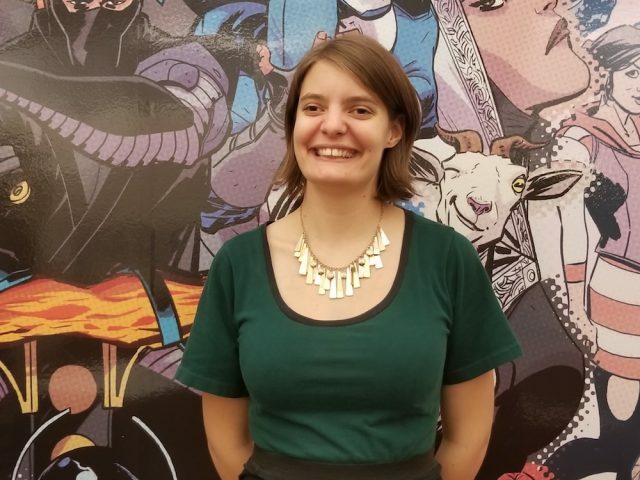 In her new role, Walchuk will be responsible for planning and orchestrating Valiant’s extensive convention schedule, including planning con exclusives, working with consignment partners, and designing and managing Valiant’s physical presence at events, all in addition to helping maintain important relationships with comic book shops around the country. Walchuk has long been a passionate member of the comic industry. Prior to joining Valiant as a freelance Sales Manager in the summer of 2017, she worked as a retail professional at several comic book and gaming stores, including Dreamers Vault in Minneapolis. She also represented British comic publisher 2000 A.D. as a volunteer Booth Associate for three years at New York Comic Con and San Diego Comic-Con. She has a degree in Communication Studies from the University of Minnesota. Valiant recently unveiled an outreach initiative known as #VALIANTVISITS, bringing the publisher’s hard-working and devoted Sales team into the global spotlight by publicly highlighting their many visits to local comic book store locations across the country and around the world. The company is scheduled to make its next convention appearance at North Carolina Comicon at the Durham Convention Center from Friday, November 9th to Sunday, November 11th.